40 pages of the most comprehensive, in-depth and unique coverage across the UK, India, Asia and the rest of the World. We take great caret cater to a wide target audience- male, female, young and old. There is something for the entire family. Our popular periodic theme based special issues are unmatched by any other title in the market. And you will receive them free of charge! 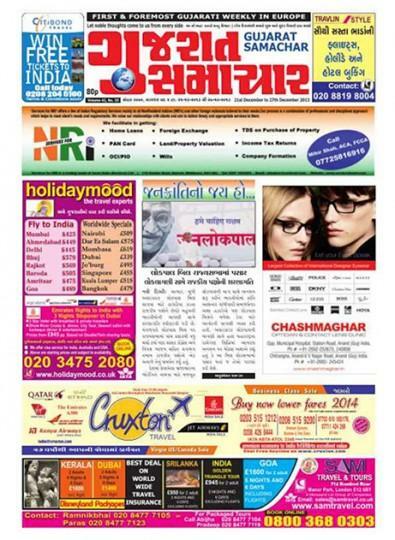 This is a wonderful newspaper, full of relative articles covering issues of culture and diversity, religious matters, family life stories, business and commerce with fact files, stories of events in and around india, community development projects, latest bollywood movie reviews, and much, much more. This is published 50 times per year, please allow up to 4-6 weeks for your first delivery.